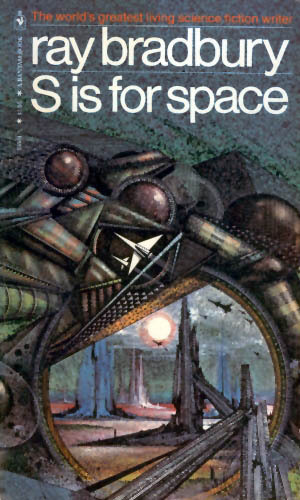 S is for Space is a collection of short stories by Ray Bradbury. There's a big variety, from a guy who turns into a crysalis and hatches, to a dead man climbing out of his grave in a future world where morbid things have been banned, to a kid who hears a woman screaming from underground, but no adults will believe her. It takes a LOT for short stories to impress me. I've read short story collections by people I adore, like Neil Gaiman, and still thought they were kind of meh. It's just not the format I prefer. Short stories often feel rushed, obviously, but worse than that, I hate when they don't end. I argued endlessly with my high school English teachers about "open endings" and how stupid they are. Well, these stories, as a general rule, did not have open endings. They were exactly what short stories should be. I enjoyed almost every one of them. So if you're like me, and you're looking for some good short stories with really interesting premises, and that don't leave you hanging, I recommend this book. This book counted for the 2012 Mount TBR Reading Challenge. This is great! I love short stories, and the only Bradbury I've ever read is Fahrenheit 451 (naturally). I've been meaning to read more by him. This would be perfect for me. Thanks for the review! I actually haven't even read Fahrenheit 451! I keep meaning to. This was my first Bradbury.